This speciality of Masi, resulting from the refermentation of wine from fresh Veronese red grapes with a percentage of semi-dried grapes of the same varietals , splendidly encompasses the qualities of the Verona area: the excellence of the zone, the highly individual style of the indigenous Veronese grape varieties, and the originality of the techniques of "appassimento" (semi-drying) and double fermentation by Masi. It combines simplicity and grace with power and majesty. It is rich, full-bodied, round and velvety, and has an aging potential of 10 to 15 years. 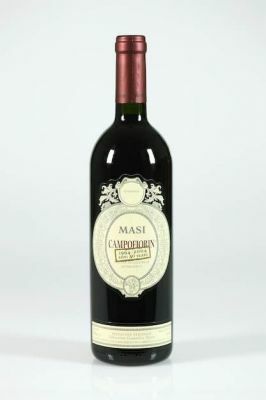 Created in 1964 using an 'ingenious technique' (Hugh Johnson), Campofiorin is the original product of the personal interpretation by Masi's technicians of an ancient vinification system used in Verona and technically known as 'refermentation'. Masi is proud to have created a completely new category in the ranks of Veronese winemaking, a class of wines that stands between the elegant simplicity of the classic wine types and the complex majesty of the Amarone, a benchmark category of other wines. Campofiorin, of course, with its unique personality, will always remain the primus inter pares of 'supervenetian reds'. Deep ruby red colour with violet tinges on the edges. Intense bouquet with hints of ripe berry fruit, baked plums and cherries. Ample on the palate, full-bodied and velvety with characteristic hints of bitter cherries and cooked fruit. Attractive aftertaste with a hint of walnut. A very versatile wine. Perfect with many different kinds of food such as pasta with rich sauces (based on meat or mushrooms), grilled or roasted red meats, game and mature cheeses.